Basic Sunday School lesson material every student should know! and what a person should do after he is saved. Too many teach classes without the students being first grounded in the fundamentals of the faith. These ten lessons, many of which will take more than one class time to complete, will make sure your class has a basic understanding of important biblical principles. Click to see a sample of The Basics Bible lessons. (If you can read this sample, then your machine can read .pdf files). The extensive material uses ONLY THE KING JAMES BIBLE! The lessons begin with a detailed explaination of what is to be taught, followed by suggestions to the teacher on how to teach it, what applicable hymns can be sung, questions to ask after teaching it, and work sheets that the student can complete in class or take home with him. Each lesson can be taught verbally, but the course can also be left with the student to complete on his own, if you desire. Doing this allows the lesson to be given to Christian school students, homeschoolers, prison ministries, and even for use for family or private devotions. When the curriculum is completed, an included certificate of completion can be awarded to those completing "The Basics". The beautifully typeset curriculum is downloaded on to your computer when purchased. From your system, this .pdf file (which most systems can read or a free Adobe reader can be downloaded to view it) can be printed as many times as you require. The 92 pages are designed to fit on standard 8 1/2" by 11" paper. You do not have to buy a copy for each student, as other lesson resources require. 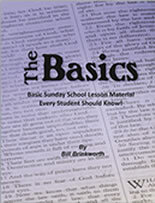 You can immediately download your copy of "The Basics" Bible lessons. Order yours today and be assured that those you are teaching, children or adults, understand basic Bible principles. Download "THE BASICS" Bible lessons today for $11.95! These daily devotionals are different from most other devotionals. Instead of reading a random verse and a short illustration about a principle taught in the verse, these devotionals are designed to get the reader to read at least one chapter a day from the King James Bible, and to teach him at least one important lesson from the day’s reading. More need to know what the Bible teaches, and that will only happen by reading it! It is not the intention of this devotional to teach all each chapter holds. A short, 200-700 word commentary teaches only one of the principles that is taught in the daily reading of one chapter of the selected book. The discussion is not a long-winded, exhaustive study of the entire chapter; just what you many want in a daily devotion! Following the commentary is a short quote reinforcing the principle taught in the commentary, several definitions of difficult or unusal words found in the reading, a King James Bible chapter of the day's reading (so you do not have go to the next room and get your Bible), and several short exercises requiring the reader to reflect on what he has read in the day's reading. When this devotional is completed, the reader will have a general understanding of what is taught in in the book he is reading. It contains the daily devotions as taught at www.OpenThouMineEyes.com, plus much more! These studies can be used by a Sunday school teacher, home or Christian school teacher, pastor, for family or public devotions, or anyone teaching the selected book. The Adobe PDF file (read with a PDF file viewer, such as the free Adobe Reader, or one that is usually already installed on most computers) is 8.5" x 11". When printed, it will produce a handout that will help an individual, class, or congregation learn principles taught in the book. If you can view the sample files below, your system already has a Adobe-reading program installed on your computer! As many pages as required can be printed or copied, and given out to a class that is studying the selected book for no additional cost. No longer does the original purchase of this e-book have to purchase one booklet per student! 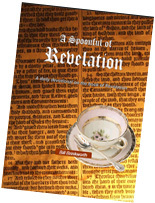 For $9.95 you can immediately download this 80-page daily devotional on "The Revelation". It will help you obtain a general understanding of what the Bible teaches from a pre-millenial and pre-tribulation rapture view! It is also designed to be used as class material in teaching The Revelation. Each day's reading includes a short 200-700 word commentary on a principle taught in the day's reading, a thought for the day, definitions of some of the words used in the day's reading, the KJV chapter for the day, and several thought provking questions about the days reading. Buy the devotion and make as many copies as you need for your class, eliminating the expensive purchasing of different handbooks for each class member! Times spoken of in the Bible's book of "The Revelation" are getting closer each day. Some of the events spoken of in "The Revelation" are just around the corner; yet so few understand what the book teaches. * How God revealed ahead of time the spiritual conditions of church-ages, and what they were and are generally like. * Who will go through the terrible prophesied tribulations. * What the two witnesses will do during the tribulation, and what will happen to them. * What the anti-Christ will do. * Who the 144,000 that will go about the earth are, and what will happen to them. * How will the mark of 666 be used in those days and what will happen to those that receive it. * What will be the judgments that God will direct to those on the earth in those days. * Who will be the great spiritual deceiver in those days. * What will happen at the Battle of Armageddon. * Who will go into the Lake of Fire. * What will happen to Satan and to the earth. * What will the New Jerusalem look like. Have you always wanted to read "The Revelation"? Using A Spoonful of Revelation you can read it now and get a basic understanding of what it teaches. Read this devotional and understand the future of the world, according to God's own Words?" Download your copy today. Download your devotional on The Revelation today for $9.95! For $8.95 you can immediately download this 50-page daily devotional on "Hebrews". It will help you obtain a general understanding of what this book teaches! It can also be used as a handout for any class that is studying "Hebrews." Each day's reading includes a short 200-700 word commentary on a principle taught in the day's reading, a thought for the day, definitions of some of the words used in the day's reading, the KJV chapter for the day, and thought provoking questions about the day's reading. Buy the devotional and make as many copies as you need for your class, eliminating the expensive purchasing of different handbooks for each class member! "Hebrews" teaches about and corrects many doctrinal principles that confused many Christians in the early churches and still confuse many in churches today. Many false teachings, traditions, and philosphies stem from doctrinal errors that Paul rebuked and corrected in the early church. Learning what this book teaches will be a help in your own spiritual life and may enable you to be a help to others that may have doubts or questions about what their religion teaches. * Why salvation is so great. * The dangers of a "hard" heart. * The "rests" spoken of in the Bible. * Why priests and Old Testament practices are no longer acceptable to worship God, and what the better alternative is. * Why holding on to worship that was purposed for people before Christ is wrong, and how its continued practice will not help anyone. * What the real purpose of the Old Testament law was. * What can be "good" about going through bad times. Have you always wanted to read "Hebrews"? By using A Spoonful of Hebrews you can read it now and get a basic understanding of what it teaches. Order the download today, so you can start reading and learning now! Download your devotional on Hebrews today for $8.95! Purchase both A Spoonful of Hebrews and A Spoonful of The Revelation devotinals at the special pricing of $15.95. Download both devotionals (Hebrews & The Revelation) today for $15.95! 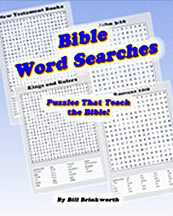 For $10.95 you can immediately download this 75-page "Bible Word Searches" booklet. In it are 52 word search puzzles. Click to see a sample of Bible Word Searches. This booklet's word searches are designed to reinforce biblical knowledge. They can be used by individuals who enjoy puzzles and are also ideal for a Sunday school, vacation Bible school, homeschool, Christian school, or any Bible teaching situation where students (third grade and higher), can be encouraged to learn more about the Word of God. It makes a good classrom activity or can be sent home with them to be completed. The puzzles teach biblical facts and also help the student learn some of the most popular verses in the Bible. Examine the sample of the booklet to the right and its table of contents to see the varied verses and Bible facts that are included within the pages. Only the KJV is used! The original purchaser of this booklet needs only to buy one copy of this booklet and then he can print as many worksheets as are needed on his printer or copy machine. The pdf-format e-book can be opened by most computers or with a free viewer that can be downloaded from www.Adobe.com). Download a puzzle book for yourself or your ministry today! Download "Bible Word Searches" today for $10.95! It may take a while to download this large (16+ mb) file! 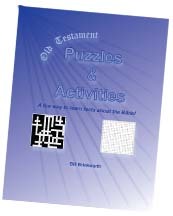 For $10.95 you can immediately download this 55-page Old Testament Puzzle and Activities booklet. In it are 30 puzzles, activites, and the anwers. This booklet's wordsearches, simple crossword puzzles, and assorted activites are designed to reinforce biblical knowledge. They can be used by individuals who enjoy puzzles and are also ideal for a Sunday school, vacation Bible school, homeschool, Christian school, or any Bible teaching situation where students (third grade and higher), can be encouraged to learn more about the Word of God. Download Old Testament Puzzles & Activities today for $10.95! For $10.95 you can immediately download this 62-page Color-A-Verse booklet. In it are 53 popular King James verses that can be colored with colored pencils! This booklet has 53 verse coloring sheets, one for each week of the year (and one extra), that reinforce the learning of many of the most popular verses in the King James Bible. I am providing this for others that have found themselves in the predicament that they could not find additional resources to use in their Sunday school classroom, in a homeschool or Christian school environment, or for their own benefit. These color sheets were designed to be used by students older than second grade. With the new interest in coloring, they can also be used for adults to help them also learn verses. Because of the complexity of much of the art work and size of the letters, they should only be colored with colored pencils. With these verse coloring sheets (and with my other Bible study material available at www.OpenThouMineEyes.com), it is not necessary to purchase one booklet per student. The original purchaser can purchase just one pdf format e-book (which can be opened by most computers or a free viewer can be downloaded from www.Adobe.com) and print as many pages as are needed on one's computer's printer or copy machine. 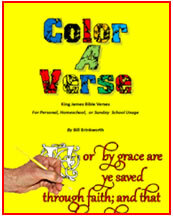 Download "Color A Verse" for yourself or your ministry today! Download "Color A Verse" today for $10.95! Purchase both Old Testament Puzzles and Activities and Color A Verse activity booklets at the special pricing of $16.95. Although they are available free, with the age of cell-phones, not everyone has a printer. To remedy the situation and so more ministries can use the Bible View, laser-printed, dual-sided masters are now available to be shipped to you. These masters can be used to print as many copies on your copy machine as you need for your ministry (as long as they are used by the one purchasing the masters). Order 2016 back copies (51 weeks) of The Bible View for $14.95 plus shipping. You should receive them within 7-12 business days. MAILED THROUGHOUT THE UNITED STATES ONLY!